I have had a pretty successful year in 2012. I put in a lot of good training and have been lucky enough to have things go well on multiple race days. Sure, there have been various mechanicals and unexpected physical hurting but for the most part my fitness (physical AND mental) has been accurately represented on race day. And usually that fitness lands me in a competitive position, vying for a spot close to the lead. And when other people see those results, they start to assume that I'm ALWAYS fast and I'm ALWAYS on my game and I'm ALWAYS motivated for the win. This is not the case. 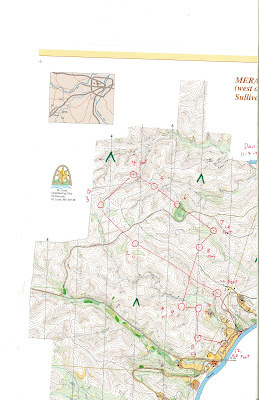 I want to bring you inside the real world of silkychrome, specifically into an orienteering race a few weekends ago, where I experienced a meltdown of epic proportions. Getting fast is hardly an easy road to travel...it can be full of self-doubt, frustration, and wanting to quit. The map. Actually this is David's map. I did not write the clues on mine but that would have been helpful. 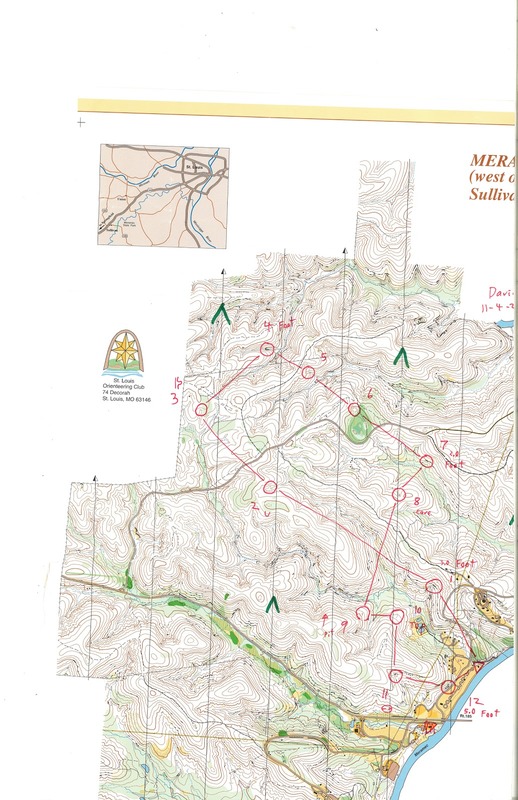 So, beginning this story, I made plans to attend the SLOC meet at Meramec State Park. Carpooling with the Alpine Shop crew, we arrived at the park with plenty of time to plot the course (the Meramec map is a weird size so the meet director has the runners plot our own courses here instead of computer printing them). I marked up my map and then talked through route choices with Jeff. We both agreed that there were lots of trail options, but the woods were probably in such great shape that it wouldn't been too much of a penalty to run through them if the climb was equitable. And, the features are really big at Meramec, so the course seemed straight-forward and fast. I was excited to run. The weather was perfect, there was another FAST girl (new to MO) to compete with, and I found a mini can of Coke in my bag which I love. On second inspection, my route from 2 to 3 looks pretty inefficient. But the woods running was almost as fast as the trail. The meet director (Gary from Bonk Hard Racing) counts me down and I sprint off down the road. I choose a low route to CP1, where I run into some slow veg, but I move through it well enough. The route to CP2 involves a long run on double-track and I hammer as best I can for it being so early in the race. My attack off the trail is perfect and I spike the control. 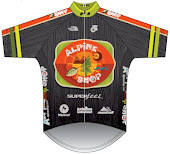 I catch up with Carrie from Alpine Shop here and we race to CP3. Before the race, I had discussed the route to CP3 with Jeff and planned a trail route, but the woods look so clean and so fast that I change plans mid-leg and run directly to CP3. I arrive at CP3, and...no control flag. The map has it marked on a pretty small/subtle spur. Normally in this situation I'd second-guess my nav, but I've been in really good contact with the map on this leg, and after a few seconds standing there scratching my head, Carrie busts out of the woods from a different direction (she stayed on the trail route) expecting to see the control too. So, I know we're in the right spot, but without a punch to verify that, we decide to re-attack and just double-check if we're both wrong. The re-attack goes well, and it puts us back at the same tiny spur, which still does not have a control flag on it. We decide to keep running up the vegetation boundary just in case, and pretty soon Carrie spots the flag on a parallel feature. 6 minutes lost. It's extremely unusual for Gary to mis-hang a control. But we both punch and then set off for CP4. This is what an explosion looks like. No spoilers here: this is where things exploded for me. I was anxious to make up time from the CP3 re-attack, I was anxious to race away from Carrie, and I was excited to run through the fast Meramec woods. I let my speed get in front of my navigation and pretty soon I'm not exactly sure which reentrant I've just descended into. I continue executing the route like I know where I am, I even find a huge rock feature that is similar to CP4's, but there is no control flag to tell me I'm in the right spot. Instead, I'm alone in the woods with an alarmingly minimal idea of where exactly I am on the map. I spend the next 40 minutes trying to relocate myself on the map. It's frustrating. I climb a hilltop to try and get a better vantage point. I run a few trails to see if I can match them up. Finally I arrive at a trail junction that seems to jive with what the map is showing. Unfortunately, it is showing that I'm a good kilometer away from CP4. Big mistake. I run the trail back to the correct reentrant, ascend it, and find the control flag in a really cool rock overhang feature. I hike the routes to CP5 and CP6. The mistake has completely shaken my confidence and motivation. I hit both cleanly, finally seeing some other people still on the course. The route to CP7 involves a road , so I muster up a half-run to make some progress where there's 0% chance of screwing up. My attack to CP7 is also clean, just slow as my feet have started to hurt a lot (still breaking in the Salomon Speedcrosses from Thunder). On the way to CP8, I am increasingly despondent. My mind is racing with excuses for me to quit. Taking a bad step and breaking my leg sounds like a good idea. Maybe accidentally tearing an ACL while jumping off a rock would work. I don't feel guilty at all for wishing these injuries upon myself. I want to quit and I want to quit now. My route crosses a road and when I reach the gravel, I stop hiking and stare down it for a bit. It leads almost directly to the finish line. I could jog the next 1500 meters back to the car and be done. Done with the map, done with the blisters, done with being slow. It's incredibly tempting. But somehow I convince myself to finish out the last 3 controls. I'm already so behind, what's another few kilometers gonna do? I push past the shortcut and descend into a deep valley. Tears have been threatening since CP4, and finally they start to leak out. Maybe the stress of relocating has finally caught up with me. 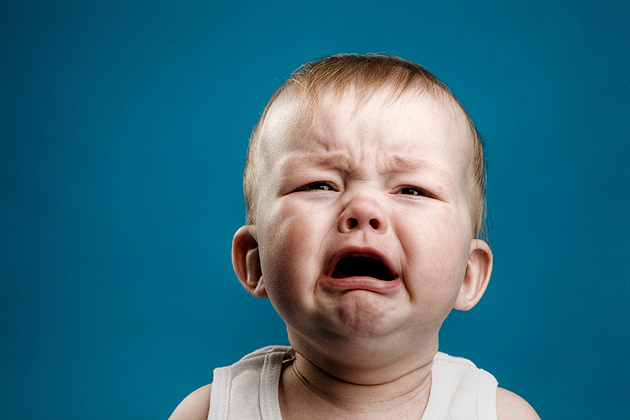 But my embarrassment/frustration over the mistake just boils over into a full-fledged cry-fest. I feel like a three-year-old in the grocery store line whose mom just told her she can't have a Snickers bar. If I wasn't on the clock, I probably would lay down in the woods, kick the leaves, and scream for a while. But screaming now would probably be heard by someone, and they would think I broke a leg or something, and come looking for me. That's the absolute last thing that I want, so I just settle for some silent screaming and more crying. I flail through the bottom of the valley, using the streambed as a handrail for my mushy brain. It's a pretty miserable leg. Worked with Carrie from 10 onwards. Despite the severe recession of my maturity, I stumble into CP9 and punch. On the way to CP10, I spot a group of orienteering kids and quickly try to get myself together. There's nothing less inviting about orienteering than a deranged, sobbing 28-year-old floundering through the woods. So I take some deep breaths and execute the route to CP10. Right as I'm punching, I see Carrie and Chuck come over the ridge right behind me. I am so relieved to see familiar faces that I immediately ask if we can complete the rest of the course together. Carrie agrees, and we make our way to CP11 at a relaxed pace. On the way to CP12, we stop to help a dad and his kid out on the Orange course. Then it's an easy jog on the road back to the Finish line, where I can finally release the disappointment of the day. Normally, after orienteering meets, I'm eager to help with control pick-up; it's a great way to get some extra nav practice without the pressure of the clock. But today I'm just checked out, and can't even stand the thought of navigating anywhere else. Thankfully there are enough people willing to help that I can take a break. Pretty soon I'm back in the car with Jeff, David, and Carrie, making tracks towards St. Louis. I am not nearly this cute. My O-meet last January at Babler was like that...with the tears, anyway, not with the speed. Way to stick it out; really, for all the awesome success you've had this year, you were probably due a frustrating outing, and in a setting where the pressure is mostly from inside is a good place for that to happen (if it has to happen).